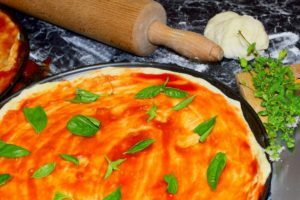 Do you love pizza, but have no way of making it at the park, beach, or in your backyard? Well, you might want to look into get an outdoor pizza oven, a positively handy item. Let’s take a look at some options for the best outdoor pizza oven right now. If you need a nice pizza oven for outdoor use, no matter where you are, the Ooni 3 Portable Pizza Oven is a really good way to go no doubt. For one, this thing is made out of pure stainless steel, which we really like. Stainless steel is tough, it is hard to dent, and it can even withstand some rain. Now, although the Ooni 3 Portable Pizza Oven is made of stainless steel, it really is not that heavy. While it does weigh a few pounds, it is still light enough to be considered portable. It has a fairly small and compact size for what it is, so getting it into the car and to the car or beach is not very hard at all. The chimney clip definitely helps with portability too. 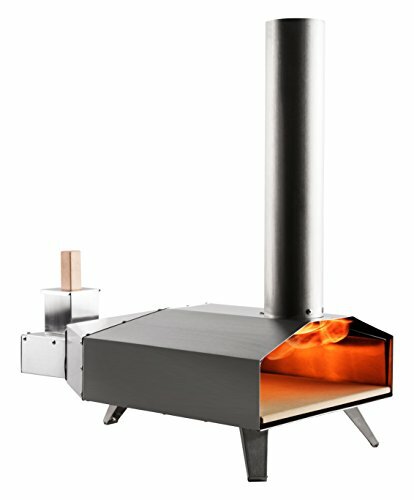 The Ooni 3 Portable Pizza Oven is a wood pellet pizza oven. We like this because wood pellets are easy to come by and there are many different types of them. This also means that you don’t have to deal with refilling a gas tank or anything like that. Wood pellets are also super-efficient when it comes to heating. The Ooni 3 Portable Pizza Oven heats up in just a few minutes, which is nice. Yeah, it will take some time to get the fire going, but once it is burning, it will heat up really quick. If you buy the proper wood pellets, you can get sustainable ones. The Ooni 3 Portable Pizza Oven can easily handle a 13 inch pizza. Now, admittedly this is not all that big, but then again, any bigger and it really would not be a portable outdoor pizza oven. Besides pizza, you can also use this oven to make seafood, veggies, and meats too. The body on this thing is insulated, so it does a great job at retaining heat. Another reason why we like the Ooni 3 Portable Pizza Oven is because it has 3 legs instead of 4, which actually helps to increase stability on uneven ground. 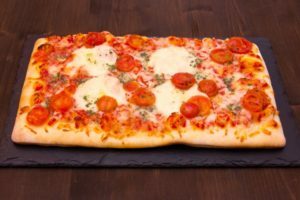 The cordierite stone baking board makes for a great pizza every single time. Unlike the first option we just reviewed, this outdoor pizza oven is propane powered. Now, we really do not have a problem with propane, as it is quite easy to use, probably easier than wood chips. Sure, you do have to make sure that your gas tank is filled up and ready to go, plus gas does not create the same flavor as wood, but on the other hand, using gas is really easy and fast. The fact of the matter is that you just need to hook up your gas tank, open it up, and hit the ignition lighter on the pizza open. What is definitely very convenient is that the Pizzacraft Outdoor Pizza Oven heats up in just 10 minutes. 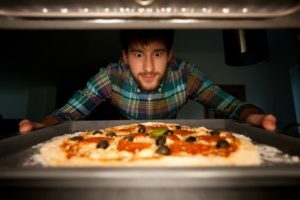 Although you probably will never need to use this thing at full heat, it can heat up to 700 degrees in just 10 minutes, which is more than hot enough to cook any kind of pizza. On that same note, a full pizza only takes 5 minutes to cook in the Pizzacraft Outdoor Pizza Oven, which is very impressive no doubt. We like the Pizzacraft Outdoor Pizza Oven because it is very portable. No, it is not a featherweight, but all things considered, it is actually pretty lightweight. It is also built very compact, which makes it easy to transport it from one spot to another. The Pizzacraft Outdoor Pizza Oven has a dual layer interlocking cordierite pizza stone with a heat diffusing hollow core. 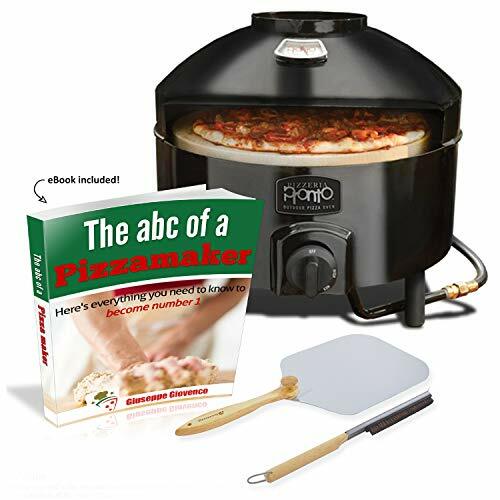 Yeah, this sounds really fancy, and it kind of is, but the takeaway here is that it allows for really even pizza cooking, so your crust is not burnt while the center is still raw. The lid features a heat-reflective heat shield so your pizzas cook evenly on the top and bottom. The shape and design of this item also makes it ideal for windy days. What is also nice here is that the Pizzacraft Outdoor Pizza Oven can cook 18-inch pizzas, so they are quite big. Now, this is a great outdoor pizza oven to go with. One thing that we need to say right off the bat is that this thing actually comes with decent carrying handles so you can easily transport it from one spot to another. However, with that being said, the Mr. Pizza Pizza Oven does weigh close to 40 pounds, making it fairly heavy. On that same note, this thing is also quite bulky. So, you do need some good space to set it up, and whoever is carrying it to and from the car better have some biceps, because lightweight this pizza oven is not. 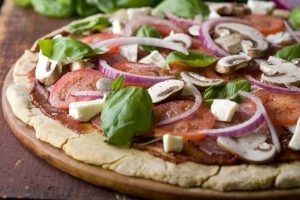 With that said, the Mr. Pizza Pizza Oven is a great option to keep in mind because it can do a lot more than just cook pizzas. Yes, it can cook 14-inch pizzas, which is of an OK size, but not too large. However, you can also use this pizza oven to make up to 20 burgers at a time, 40 hotdogs, calzones, and various other foods too. It’s definitely quite the versatile pizza oven. Yet, for it large size and weight, we don’t understand how it can make 14-inch pizzas at the maximum, but it’s versatility for cooking different foods does make up for it. 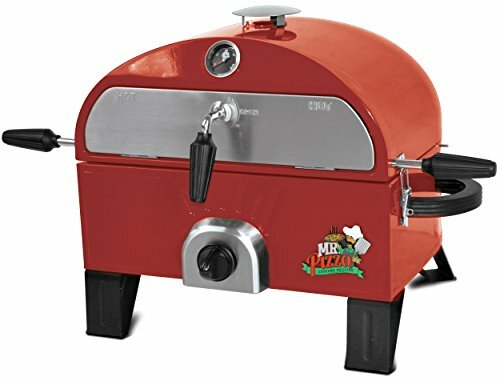 The Mr. Pizza Pizza Oven is a propane-powered pizza oven. Once again, while it is not super ecofriendly, propane is very easy to use. Just fill up the tank, hood it onto the valve, open the valve and tank, and hit the ignition. It should be noted that the ignition works well, but it does degrade over time, so you might end up using matches or something similar to light it. 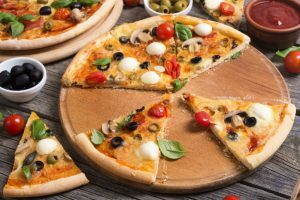 We like the design of the Mr. Pizza Pizza Oven, as beside the space for pizza, it also has a warming area to heat up cold foods and keep them warm until they are ready to serve. The solid stainless steel build is something else that we really like about this particular pizza oven. The cordierite pizza stone is a bonus, something we always like to see. 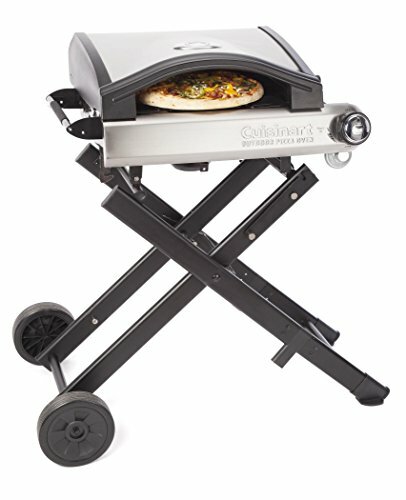 Yet another cool option to keep in mind, the Cuisinart Alfrescamore Outdoor Pizza Oven is definitely very modern looking. It features a sleek design and is made out of stainless steel. This pizza oven is quite tough and durable, as stainless steel tends to be. Sure, you probably shouldn’t drop it, but it can handle some bumps no problem. One thing that does need to be said here is that the legs are designed in such a way that it needs to be on flat and even ground to stand right; it won’t stand well on uneven ground. We do like the fact that this is a nice little 15,000 BTU gas-powered pizza oven. Being gas powered is of course convenient. Sure, it might not be the most ecofriendly option around, but at least you don’t have to light and tend to a fire in order to use it. Just hook up the gas, hit the ignition, and you are good to go. Now, what does need to be said here is that the ignition works well for the first few months, but as tends to be the case with these kinds of things, the ignition does wear out pretty quickly. 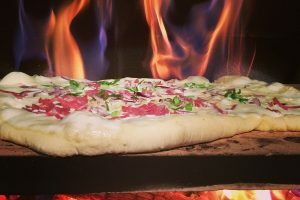 We like the Cuisinart Alfrescamore Outdoor Pizza Oven because it heats up in under 10 minutes, making it quite fast acting. On that same note, your standard pizza will cook in about 5 minutes flat and is ready to go for another pizza as soon as one comes out. 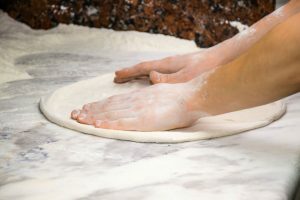 The 13-inch cordierite stone helps to ensure that your pizza is cooked even from one side to another, plus it can also be removed for easy cleaning. This oven can be used for other things besides pizza, plus it also comes with a warming tray and a smoking cup too. The Cuisinart Alfrescamore Outdoor Pizza Oven weighs under 40 pounds and comes with carrying handles, but it is a little bulky nonetheless. 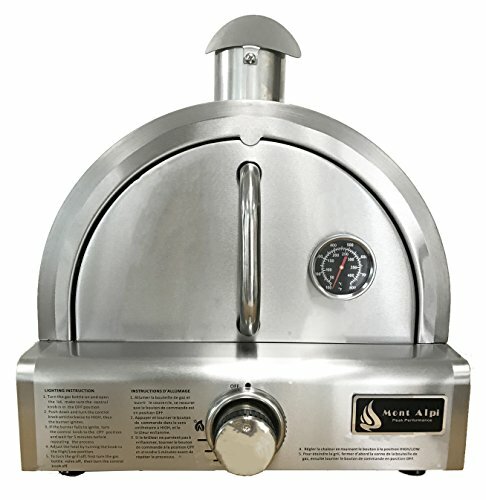 If you need a nice outdoor portable pizza oven, the Mont Alpi MAPZ-SS Pizza Oven is yet another good option to go with. Now, this thing only weighs 27 pounds, which is nice because it is not too heavy to lift and to transport. However, it is very bulky and also does not have carrying handles, both things which can make transportation a little difficult. With that said, the Mont Alpi MAPZ-SS Pizza Oven is very durable. It is made with thick high-quality stainless steel. It won’t rust or corrode, and it can definitely handle high heats and some bumps without breaking down. This is a 12,000-BTU propane powered gas pizza oven. Of course, propane is quick and easy. Hook up the gas, hit the ignition, and you can start making pizza in no time at all. It only takes about 8 minutes for this thing to heat up to its highest temperature of 550 degrees. However, you probably don’t need it to be that hot anyway. It can cook a pizza in about 6 minutes, which is pretty impressive as well. 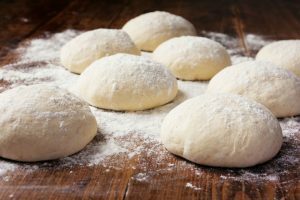 We do like how the Mont Alpi MAPZ-SS Pizza Oven is made to be easy to clean, especially the pizza stone, which works well to evenly distribute heat for an evenly cooked pizza. 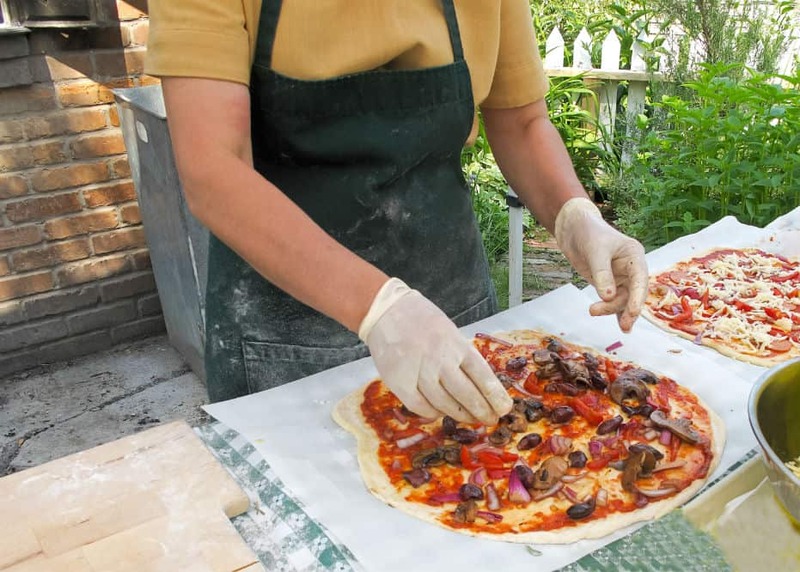 The bottom line is that there are plenty of really nice portable outdoor pizza ovens out there. You can select between wood-fired or propane, you can get small or large ones, and you can get all shapes and sizes too. 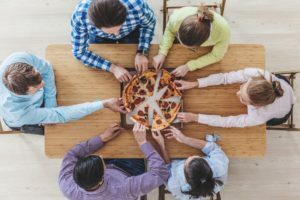 We would definitely recommend going with one of the above options we have reviewed if you are thinking of getting a portable outdoor pizza oven.